The toughest thing in any team sport isn’t necessarily winning a title. Rather it is trying to sustain success. The Nashville Predators are now finding out what life is like when you can’t sneak up on teams anymore. Last spring’s run to the Stanley Cup Final energized the city, turned a host of people who never even considered hockey worth watching into rabid fans, and put Nashville on the NHL map. The Predators reached the Final for the first time in history, but were defeated in six games by a veteran Pittsburgh Penquins team that became the first Stanley Cup repeat winner in decades. But the Predators’ surge to win the Western Conference championship, one that saw them defeat longtime nemesis the Chicago Blackhawks, as well as the Anaheim Ducks and St. Louis Blues, was the sports story of the year in Nashville. However they had a turbulent offseason. Captain Mike Fisher retired. One of their top scorers James Neal was taken in the expansion draft. Plus the team became a known commodity to other NHL teams, a conference champion, someone to take seriously. The players all said during the offseason they recognized things would be different in the 2017-18 season, that now they would be seen by other teams as part of the elite and would get every team’s best effort. Well the season has now begun, and early results were not good. The opening game saw the Predators fall behind quickly to the Boston Bruins. They rallied late to make the final score a respectable 4-3 loss, but none of the players were fooled by that. Certainly head coach Peter Laviolette wasn’t, commenting that the Predators had not seemed to have their heads in the game yet, and perhaps some players were still having a hangover from last season’s success. However that game was a classic compared to what happened Saturday. In their first trip of the season to Pittsburgh they got pounded 4-0. Considering the past troubles Predators’ number one goalie Pekka Rinne has had in Pittsburgh, the Predators opted to let number two goalie Juuse Saros get the start. The very first shot he faced from Evgeni Malkin from the slot zipped right past Saros. Only one minute and six seconds in the Predators were already behind 1-0. It didn’t get any better from that. Indeed, the only positive thing that occurred during the entire evening was the Predators standing up to repeated Penquin attempts at intimidation, with the teams combining for 64 penalty minutes in the third period alone. Some of this is to be expected. The Predators are battling injury problems. Ryan Ellis won’t be with the team for much of the first half, as he is recovering from surgery. Kevin Fiala is now battling an upper-body injury, and was replaced Saturday night by Pontus Aberg. The Predators also replaced Alexei Emelin as third line defensemen Saturday, pairing him with Yannick Weber, while Calle Jarnkrok centered the second line, and Nick Bonino was shifted to the third. The Predators have encountered some early season scoring problems, and had only one even strength goal through their first two games. Now certainly no one is ready to panic. 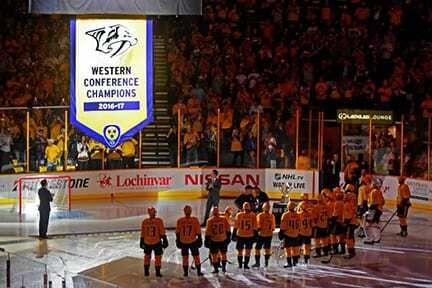 It’s a very long season, and the Predators were welcomed home to Nashville Tuesday, with the Western Conference championship banner raised and another sellout crowd there to greet them. What the Predators don’t want to do is get off to another slow start, then again have to fight their way into the playoffs. While it was amazing to watch them claw through the ranks last year as the last team in, reality says that seldom happens twice. Better that this season they actually not only have a better regular season record, but are able to have the home ice advantage in at least one round. After all, perhaps if they had been playing more games in Bridgestone Arena last season, who knows what the outcome might have been.